So, I was going to make potato soup this weekend. But when I was at the grocery store they had these HUGE, lush bunches of kale that were so glorious and amazing that I thought about buying a cart full just so I could bring them home, throw them on the floor and roll around on them. I’m not even kidding. I had to buy some. Then I was strolling around the store with my ta-die-for kale the way a rich person walks around the mall with designer shopping bags (my imaginary audience was all like, OMG look at her kale!! and Gurl, I wish I had me some of that kale!) wondering what in the world I was actually going to do with it when I remembered the Zuppa Toscana at Olive Garden (thin potato soup with sausage and kale). So, I bought some Italian sausage and headed to the house. 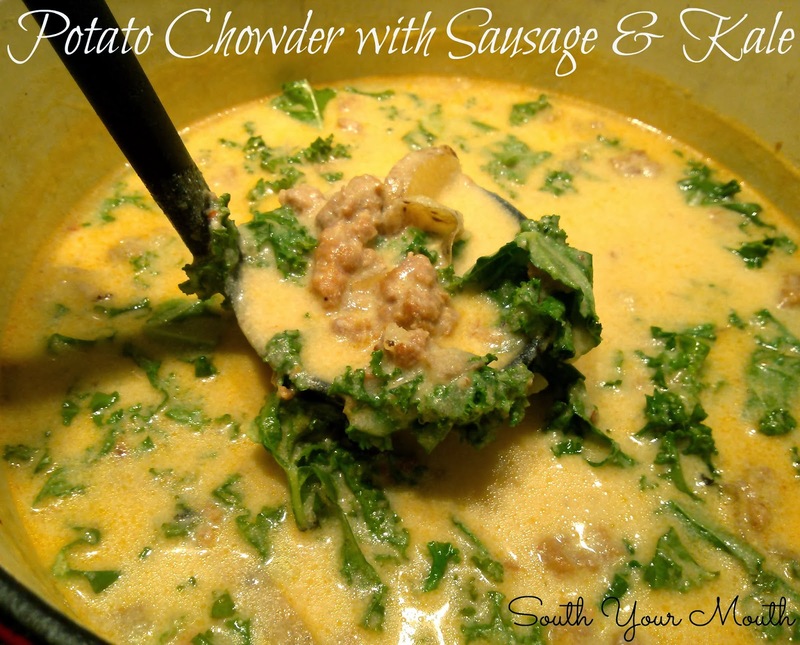 I’d seen enough copycat recipes of Zuppa Toscana to know the world didn't need yet another recipe for that so I decided to just make my potato soup like I usually do but add a lot of garlic, the sausage and then hit it with the kale at the end. It was SO good! The sausage is so tender and gives the chowder just the right amount of heat and then the kale gets just a little wilted but still has a slight bite. It was glorious! I asked everybody on the FB page whether to call this a soup, stew or chowder (it really is too hearty to call soup) and it looks like most folks leaned toward chowder so that’s what we’re calling this! Remove sausage from casings if applicable. Brown sausage over medium-high heat in a Dutch oven or soup pot until no longer pink. Add onions and garlic and continue to cook for 2-3 minutes. Add chicken broth. Wash potatoes and cut into 1/4-inch slices (I didn't peel mine but you can if that’s your preference). Add potatoes and salt to taste. Bring broth to a low boil, cover pot, reduce heat to medium-low and continue cooking for 40 minutes. While whisking rapidly, slowly pour in half-and-half. Continue whisking until broth becomes smooth and creamy. This is necessary to emulsify the fat from the sausage into the broth and cream and also helps to break up the potatoes into rustic chunks. Taste for seasoning and add more salt to taste if necessary. Continue cooking until chowder just begins to simmer (about 10-15 minutes). Remove from heat, add kale, stir to combine then return lid to pot and let stand for 10 minutes before serving. *Half-and-half is common here in the US but if you’re elsewhere in the world, it’s just half milk and half cream. Half-and-half typically has about 12.5% milk fat. I do use quite a bit of spinach when I cook, but I can honestly say not much kale at all. I'm always worried that it will come out all yucky, I find it a bit tricky for some reason. You really need to try the kale. I only used a half bunch and tossed the rest since I don't use it for anything else but it was $1.24. It is awesome!! Made this afternoon. It was delicious! We used a half bunch of kale - it was pretty big. The kale had a great texture. I would recommend peeling the potatoes, though. The little bit of peel on the slices came off and added a weird texture. Would definitely make again. We made with mild pork Italian sausage and the adults could add a bit of red pepper flakes if needed. We also used stock rather than broth. A great hearty winter dish without being overly heavy. We only have big bags of Kale at our grocery store so I buy it, use some in the soup, blanch the rest for about 2 minutes, then drain and put in freezer bags so I'm ready to go the next time. it holds up just fine after being frozen.Also, the soup (chowder) freezes just fine too.